Do you know... that the nests of trap-door spiders are generally in groups? This man's bees are in grave danger. So is our food supply. Why something so small matters so much. Bees crawl all over my body. I sit in the mud of a road embankment, watching the throngs that have landed on my legs. At the peak of one knee, three worker bees stand in urgent conference, sniffing: They stroke one another rapidly with their antennae, which house their organs of smell. All around them, their sisters tumble. Pairs of bees seize each other around their minuscule midsections and wrestle. Others go about their private business in the midst of the crowd, using their forelegs to groom their furry faces and long tongues. I watch, calm and safe inside my borrowed beekeeper's gear: white coverall, veiled pith helmet, protective gauntlets. Just down the road, Jeff Anderson and his three assistants methodically pry the lid off each of hundreds of hive boxes to check the health of the colonies inside. As the day wears on and the March sunshine warms this little-used ranch road in California's Sierra foothills, more and more bees take flight. Wild buckthorn bushes lining the road carry clusters of tiny white flowers, their anthers bright with pollen. Bees work the blossoms, packing the yellow grains into smooth depressions on their hind legs, specially designed to carry this fuel (pollen is a high-protein food) back to the hive. On their travels, they transfer pollen from plant to plant, flower to flower, fertilizing the blossoms and allowing them to set fruit. This ancient partnership of pollinator and plant is essential to life as we know it. One-third of the food we eat comes from crops that need animal pollinators, a role often filled by bees but sometimes by butterflies, beetles, birds, or bats. Bee-pollinated foods include squash, tomatoes, peppers, apples, and pears. Unfortunately, the honeybees surrounding me are members of a threatened tribe, whose loss would have a dire effect on farmers, not to mention everyone who eats fruits and vegetables. 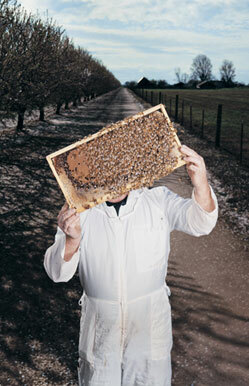 Bees became the focus of Jeff Anderson's life 30 years ago when he married his wife, Christine, a beekeeper's daughter. He joined his father-in-law, Joe Tweedy, in the family business. Ever since, he's been shuttling a carefully tended stock of honeybees cross-country, following the bloom of crops from California's early spring fruit orchards to Minnesota's summer fields of clover. Anderson's grown son Jeremy, working beside him, represents the fourth generation of beekeepers in the family. 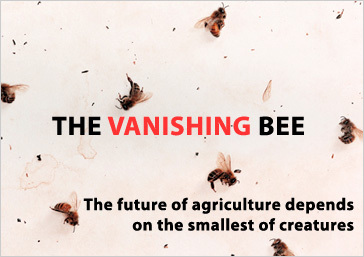 Without the services of managed honeybees, provided by migratory beekeepers like the Andersons, billions of dollars' worth of crops across the United States would fail. I join Anderson as he opens another hive. Inside, eight wooden frames hold honeycomb whose surface is crowded with bees, all in constant motion though there seems to be no room to move. Speaking with an upper-midwestern lilt -- Anderson grew up on a Minnesota dairy farm -- he points out the queen, about 30 percent larger than the thousands of her worker-bee daughters who feed, build, and clean the hive. One or two black drones, males whose only function in life is to mate with a queen, stroll among the busy workers. As he moves through the bee yard, Anderson can tell at a glance how each colony is doing. If all is well, the frames of honeycomb will be thick with bees giving forth a contented hum. But sometimes half the frames are bare and the bees just don't sound right. Sometimes the ground beneath a hive box is covered with bee carcasses. Since Anderson began, in 1976, raising healthy bees has become more and more difficult. In the 1980s, two non-native species of parasitic mite infested North American honeybees. One of the species, Varroa destructor, has proved especially deadly. Meanwhile, safe pastures where bees can forage without being poisoned by pesticides are becoming increasingly rare. The domesticated European honeybee was introduced to North America 400 years ago by colonists at Jamestown and Williamsburg to provide their settlements with honey; few bees native to the continent produced enough honey to make harvesting viable. Since then, the honeybee has spread into every farmable corner of North America. The cultivation of honey is an age-old pursuit: To maximize its production, beekeepers in Egypt during the time of the pharaohs floated their hives down the Nile to areas of abundant bloom, with some success. Early American beekeepers also transported their colonies -- on buckboard wagons, Mississippi River steamboats, and trains -- also with mixed results; the hives could not always be moved at the right times, the wax in the honeycombs often melted, the worker bees were sometimes left behind while their homes drifted downriver. In the 1940s, when new interstate highways and reliable long-haul trucks made it practical, beekeepers began regularly migrating long distances with their hives, following the flow of nectar as crops bloomed with the changing seasons. In the boom years following World War II, large swaths of natural habitat across the United States were devoured by suburban development and agriculture. Patches of wild woodland, shrubs, and flowers that had supported native bees dwindled. The common practices of modern agriculture -- the widespread use of pesticides and the tendency to wipe out every wild flowering plant in sight -- began to destroy the pollinators that make farming possible. Beekeepers, accustomed to paying farmers for the privilege of stationing their beehives on land with blooming crops, started to receive payment from farmers for their pollination services. Today, migratory beekeepers follow this trail of money back and forth across the country as pollination fees continue to rise. The United States and Canada are home to at least 4,500 species of native bee, from the sleek, iridescent blue mason to the plump, lemon-yellow bumblebee. All are at risk. "Where we live in Minnesota," says Anderson, "the local farmers will let their second cutting of alfalfa or red clover bloom, to feed the bees. A number of those people will tell you that the native bees just aren't there anymore." This article was made possible by a generous grant from the Larsen Fund.